Given that soccer is the unofficial sport of my home country of Nigeria, you'd think I'd be some superfan or something. But, nope, it does nothing for me. However, based off the World Cup 2018 tournament and the games I managed to check in for a few minutes, 85% of the players are cute! Do you know what I did get hyped for during this year's series? The Nigeria kit created by Nike. It is was so stylish and worth the hype because damn near everything sold out. Especially the tracksuit. That was one item I was eyeing ferociously and it sold out within minutes. Blah. But the green envy went away when I saw photos poppin' up all over the internet of people rockin' and repping Nigeria hard. One person who showed his loyalty was Winston Duke. Given his character on Black Panther was heavily influenced by the Igbo tribe (I'm certain of this! 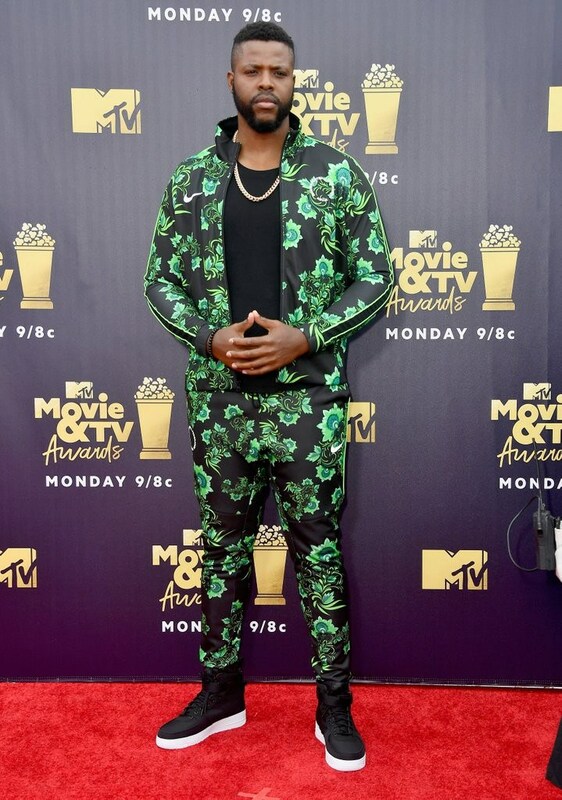 I don't care, I don't care), I wasn't surprised when he showed up looking so handsome in the tracksuit at the MTV Movie and TV Awards. Hey, Nigeria did get eliminated early but at least we can boast of having the most fashionable World Cup 2018 kit of all time...OF ALL TIME.